Redcoats & Rebels at Old Sturbridge Village. Photo courtesy Old Sturbridge Village. (Sturbridge, Mass.) 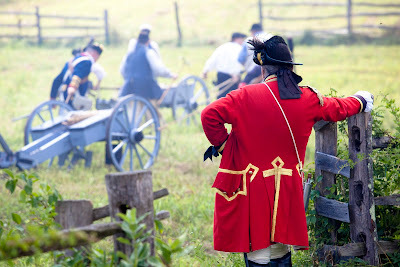 July 18, 2011 – Old Sturbridge Village’s “Redcoats & Rebels” is New England’s largest Revolutionary War reenactment, and this year’s event will be the largest to date. Nearly 1,000 soldier reenactors from eight states who will participate in the August 6 - 7 event, which features mock battles, drilling, musket and cannon demonstrations, fife and drum music, and the chance to see military life up close. Mr. Butler is the Commander of the Yarmouth Minutemen. Since Old Sturbridge Village offers a free return visit within 10 days, visitors can attend both days of the event for the price of one. Admission also includes extended hours on Saturday, Aug. 6, when the Village will remain open until 8:00 p.m. for the Twilight Encampment, where visitors can mingle with the soldiers around their campfires. For details, visit www.osv.org or call 800-SEE-1830. More than 40 units from eight states will participate in the reenactment, including six companies attending for the first time. More soldiers will participate in Redcoats & Rebels this year than in any of the previous eight years of the event. Reenactors portray British and Colonial soldiers, as well as their allies from Ireland, Scotland, Wales, Germany, and France. This wide range of companies is an accurate representation of the nations and soldiers who fought in the war for American independence. Following a parade of British troops through the town, the Village fields will become the site of a mock battle each afternoon. Troops will reenact a battle scenario where Americans and their allies attack a British-occupied town. Visitors can see surgeons “treat the wounded” and see the American troops get their smallpox inoculations. Throughout the day they can tour behind-the-scenes in both the British and American camps to learn what life was really like for these 18th-century soldiers -- how they ate, slept, and even how they did laundry. Other events designed to provide a look into the lives of soldiers include reconnoitering with a Ranger from Peter’s Corps, and a prisoner exchange between the Americans and British (Saturday only). Special events on Sunday include a Sunday Service for the troops, the arrival of American soldier’s pay and uniforms, and a court martial trial with the HMS Somerset. Young visitors will enjoy learning the real words to “Yankee Doodle,” making tri-cornered hats, and drilling with the Second Massachusetts Regiment. In addition, visitors can learn about the fashions and customs of the time during programs like “Mrs. Peabody’s Levee” – a look at 18th-century foundation garments presented by the group “Ladies of Refined Taste,” which will also present “Runaway Runway” – a look at civilian clothes in the late 1700s. Military fashions through the years will be presented by the Tenth Massachusetts Light Infantry. On Saturday, music, dancing, and ball games will be featured. A complete schedule of activities can be found at www.osv.org. Another new unit, Butler’s Rangers, led by David Sorek, of Monroe, Conn., portrays a group of Loyalist soldiers fighting for England – a unit largely forgotten by history. According to Sorek, the original members of Butler’s Rangers were average Americans working hard to build a good life for their families. When faced with the prospect of war, they chose the status quo and loyalty to the Crown, and were persecuted for these beliefs and stripped of their belongings. Joining Butler’s Rangers gave them an opportunity to take back what was theirs. Prichard’s Company: King Rangers 2nd Co. I am a Sturbridge resident who is a member of the United Train of Artillery out of Rhode Island. This is, by far, our favorite event of the year. It is fantastic! I hope lots of Sturbridge Residents come out to see the Village in a whole new way. Your Mother Was Right: Think, Then Speak.